NOAA shows the storm trajectory, as of 5 a.m. Thursday. 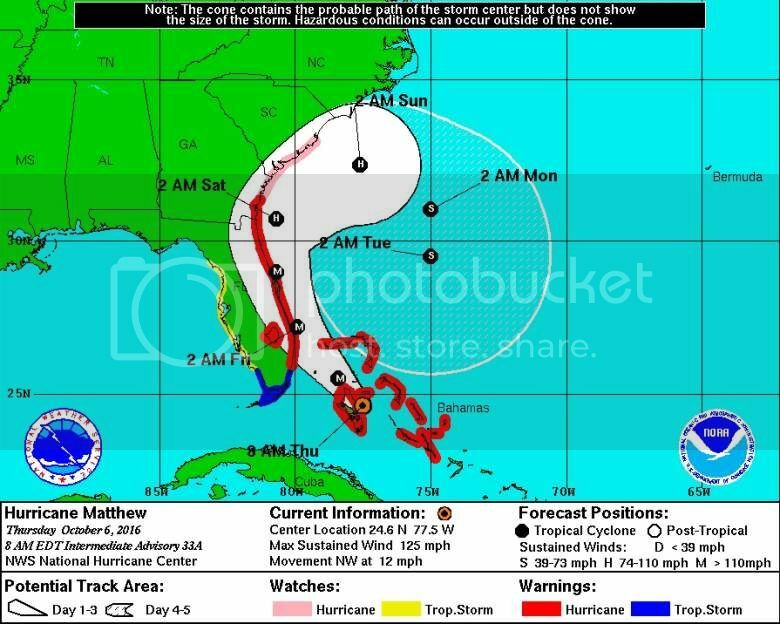 As discussed in Members chat thread.... there are RT members who hail from Florida and other East Coast States in the path of Hurricane Mathew. I have been in touch with "Maltese Mama" (Mal).. who was prepared.. well stocked with supplies.. I hope she can check in, but that may not be possible with power and/or internet outages. Mal is close to the coast in Delray Beach (South of West Palm Beach)... I have not heard anything, but it's possible she in an evacuation zone?? Hi everyone. All is fine so far. My friend/neighbor asked me to ride out the storm with her 11 and 14 yr old and their elderly babysitter. The 11 yr is scared. I spent the morning packing a bag of clothes, a bag of dog stuff, a bag of food and medication and toiletries and a bag of flashlights, lanterns, batteries and a radio. It took a lot longer than I expected, but I wanted to be prepared. They have kept me busy since I got here. We still have electricity and are having dinner now. I am a few miles west of the beach, so am not in an evacuation zone. The rain just started getting heavy. The sky is gray. The wind isn't bad yet. Great to hear you are OK. Hoping for the best Mal. Stay safe and thanks for helping your friend's children. Hi Carm. She's a Flight Attendant and couldn't get a flight back here. I love her, her kids and their cat. They are like family. Things still aren't bad here and we still have power. We have a Fire Station nearby, so I hope we are on the same grid! So good of you to be there for them, I'm sure your being there gives your friend a lot of peace . It's looking like the Hurricane will hit North of you Mal. So I hope you escape the worst effect.. my thoughts are still with the rest of Florida.... well... most of the rest.... NOT Casey Anthony!! Not much happening here. Still have lights and air conditioning. Look Mal... we are all geared up to feel bad about you in a storm... could you at least run outside and get your hair wet? Mal, so happy to hear that Mathew so far has been nowhere near as bad as predicted and that you are safe and sound. Wishy you sunny skies Mal!